The Novara range from Ercol has been designed with clean, contemporary lines, subtly outward curving arms and beautifully shaped, pale oak legs. 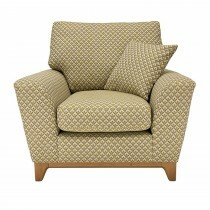 It is as comfortable as it is beautiful, with its deep, sumptuous cushions. Choose your upholstery from the subtly textured weaves and on trend accents of the natura collection. Includes a scatter cushion filled with luxuriously soft dequilled duck feathers.